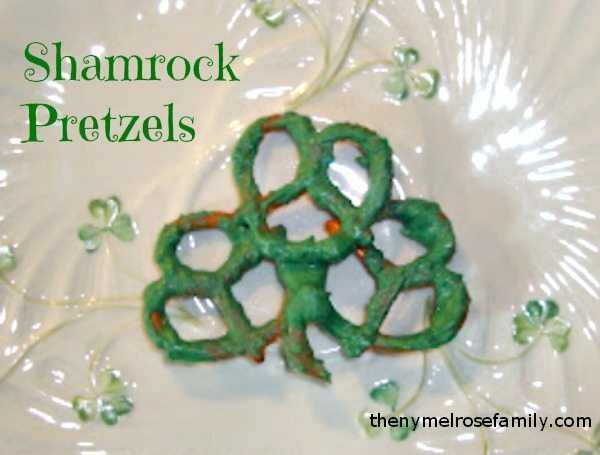 These Shamrock Pretzels are a pretty treat that’s easy to make too. I took my two favorites, sweet and salty, and combined the two. Kind of like me, but a little sweet and saucey, but I digress. I melted the chocolates in a microwave safe bowl and dipped the edges of the pretzels in them. 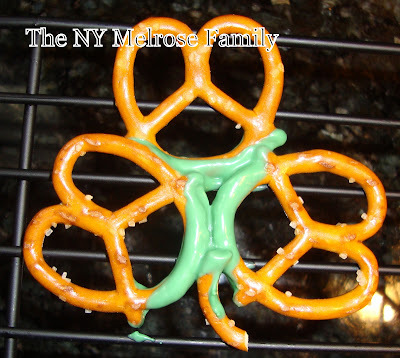 I then connected three of the pretzels to make a shamrock shape. I added a stem from the broken pieces of pretzel. I allowed the chocolate to cool on a cooling rack before moving them. Next, I painted the chocolate onto the shamrock shape. That’s right. Painted. I used a barbecue brush to paint the chocolate on. I then allowed the chocolate to cool before attempting to move it. I’ll be honest, I lost a couple of pieces because when I tried to pull them off of the cooling rack they broke apart. The chocolates were enough for about twenty shamrocks and the plate of chocolate covered pretzels with rainbow sprinkles that you see in the picture. These are super simple to make and so good. Just ask my husband. I think there’s only about half the plate left. I packaged the pretzels in shamrock bags from Michaels to thank my mom who watches Riley three days a week and Ms. Marie who watches Riley the other two days. 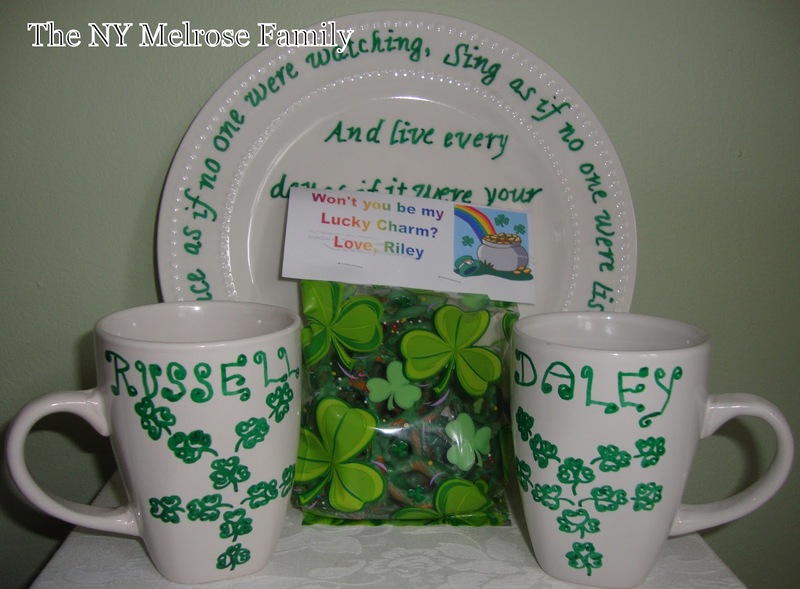 The St. Patty’s Day Mugs are also part of their gifts. The Irish Blessing Plate just made a great background. Sorry mom that’s all mine! Brilliant I tell you! My kids would love this. so cute, I would try doing them on wax paper or parchment and they won't stick. I wish I had more time to try these, because I think this is so cute! SO clever! I can't WAIT to try this with Munch! What a great idea! My partner in crime would love these. She loves dipping pretzels in chocolate! This idea would be perfect for her. Now following! Such a neat idea. I love the sweet and salty combination. Cute idea! I am now a follower! YUM! Chocolate covered pretzels are my favorite! I never would have thought to use pretzels!! These are so cute. Thanks for sharing at oopsey daisy! Yummy!!!! Pretzels + Chocolate = TO DIE FOR!!! Thanks for sharing this at The DIY Dreamer ~ From Dream To Reality!!! Cute idea, and I love the salty/sweet combo! 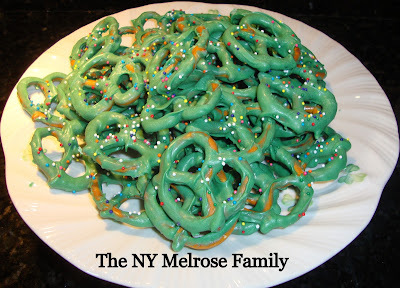 I love chocolate covered pretzels and this is a cute twist for St Patty's Day!! So fun and festive!! Thanks for sharing at Terrific Tuesdays. So clever! 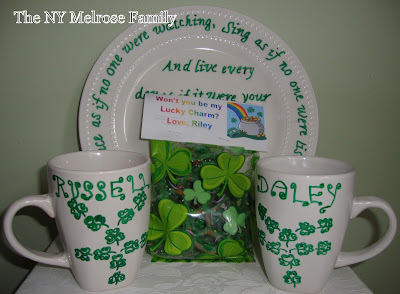 What a great St. Patty's day idea! stumbled onto your blog and just wanted to leave you a little blog luv! Def enjoyed reading this post! !def a gr8 idea! So cute! Going to have to make some with our gluten free glutino pretzels! Cute, easy, and perfectly seasonal. I'd love to have you join me at Seasonal Sundays. 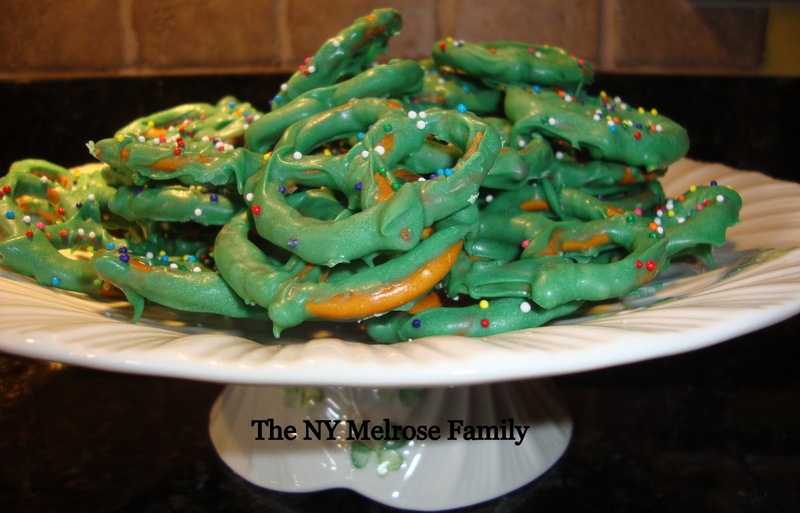 These are sooo adorable and what a great treat for ST Patty's Day! Thanks so much for sharing with the Pink Hippo Party.. can't wait to see what you share next! Lovely!!! These look so great and I love that it's simple 🙂 I feel like I can totally do this!!! Thanks so much for sharing this with us at Sharing Saturday. hope to see you again next week. Those are so cute, Jenny! I have to make those for my kids. Thanks so much Randi! You can’t beat the combination of salty and sweet. Very cute! My kids love pretzels so this would be a great treat for them! How adorable! 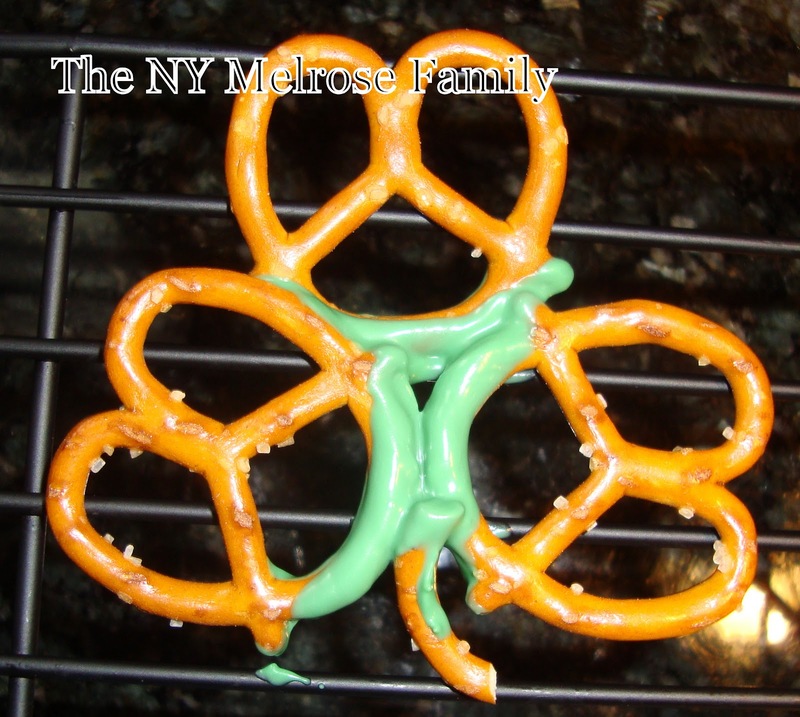 We are very into St. Pat’s day at my house, and I will be making these with my daughter! Thank you and I hope you can stop by my enchanted oven to say hi! I’m so glad you liked them Lisa. We always go over board for St. Patty’s here. So you’ll be sure to find tons of posts from last year and coming up soon for the big day. Cute! Can’t go wrong with pretzels and chocolate- or candy! These would be perfect for a school party :o) LOVE!! Thanks so much Meredith. I hope you’re feeling well. 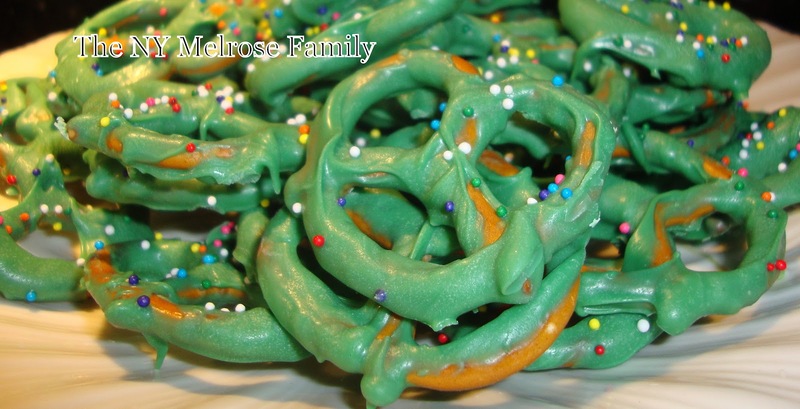 Thank you so much for sharing these cute little Shamrock Pretzels at last weekends link party @The Weekend re-Treat! Hope to see you link up again this week!